FFU is generator set with motor inside which is used in the turbulent layer and laminar flow clean room. It has characteristic of continuous use. The air flow can reach 0.45mm/s ±20%. semiconductor ,electron , flat-panel display , disc-drive , manufacture and optics , bio-engineering , clean bench, clean room , and any other places. 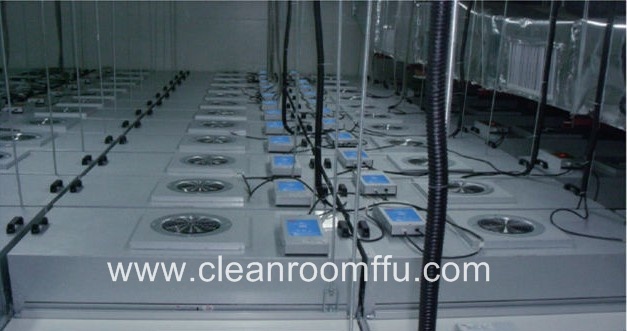 FFU is generator set with motor inside which is used in the trubulent layer and laminar flow clean room. It has characteristic of continuous use. The air flow can reach 0.45mm/s ±20%. long-life span , low noise , small vibration , adjudtable speed . It can control thousand unit together . It is tested according to the standard of ISO14644-1 before package.